Here is a photo found for sale on www.ebay.com in January 2001. Can you identify this 19th century international man of mystery? There's something special about this old man, staring straight into the camera. Can you imagine what he saw in his long lifetime? 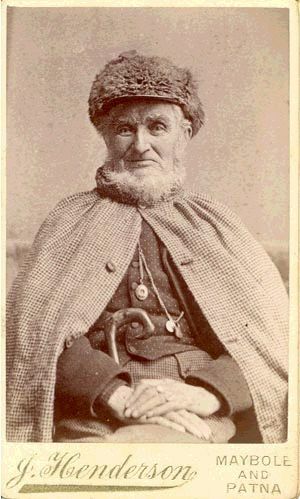 A wonderful photo of a rather grizzled looking old gent wearing a fur cap. He's also a bit of a fashion plate, with his checked cape and trousers and a polka-dotted vest. He's wearing an extremely elaborate watch chain and fob, with what looks like a locket attached to one end. The handle of his cane is visible resting under one arm. Photographer is "J. Henderson" of Maybole and Patna (Scotland).